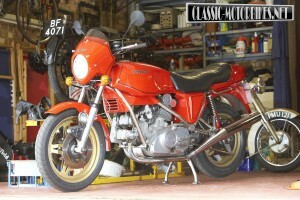 It has been over 30 years since Hesketh Motorcycles produced their last new model back in the early eighties. 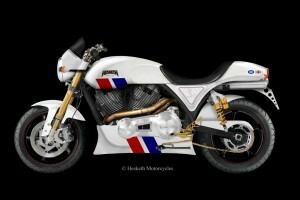 However, it is in 2013 that the re-launch of this famous brand will reach fruition as Hesketh owner Paul Sleeman, will unveil details of the first all new Hesketh model before the end of the year. Known as ‘The Hesketh 24’ (the number of the Hesketh Racing F1 Grand Prix winning car of James Hunt) the new model will bring the great British brand into the 21st Century with high quality engineering and a uniquely British design. Hesketh has also undergone a careful rebranding since Sleeman took over, celebrating the British roots and high quality of these gentleman’s motorcycles, the marque now has a new logo and new modern website at www.heskethmotorcycles.co.uk . The first official Hesketh Motorcycles merchandise in more than thirty years is also now available to buy directly on the website. Featuring the new vintage Union Jack design on t-shirts and 100% soft lambswool embroidered jumpers, these items are made to reflect the quality of this high class brand. Prices start at just £6.95 for a genuine leather embossed Hesketh keyring, while the red, white and blue embroidered cap, celebrating the team colours of the famous Hesketh Racing F1 team and the success enjoyed by the notorious James Hunt in his F1 car, comes in at £14.95. The black, round neck t-shirt with vintage union jack and Hesketh logo design is available in sizes small to XXL and retails at £31.95. While the lambswool jumpers in black with embroidered Hesketh logo detail on the breast, also small to XXL are available now for £59.95. The pièce de résistance of the new collection is undoubtedly the luxuriously soft Hesketh leather jacket. Handmade, from the finest leather, this casual jacket again continues the Hesketh red, white and blue theme with the different coloured leathers bordering the collar and central zip. Fully lined and with the Hesketh logo applique on the arm, chest and back, this is truly a unique jacket of quintessentially British design. Each jacket is hand sewn from the butter soft leather and will remain one of only a small number to be made; this coupled with the timeless design, means this jacket remains a piece to be enjoyed for life. 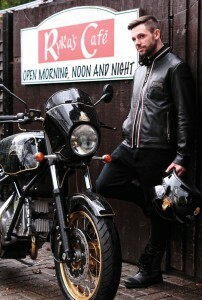 The classic Hesketh leather jacket will be available in the Hesketh online shop from mid-December at £595.